When we take time to evaluate, we gain insights and build shared understanding to better direct our work. This toolkit is a companion to the resource The Power of Reflection: An introduction to participatory evaluation techniques (available in English and French). Use it to deepen your understanding of a participatory approach and to broaden your options for techniques to use with your community group or partnership. 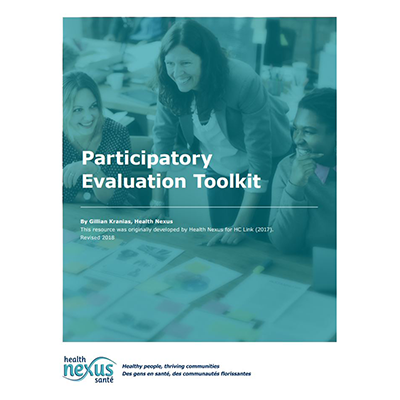 evaluation activities are both empowering and effective, and outlines steps for coordinating evaluation activities. Following this are descriptions of seven participatory evaluation techniques to help you (re)inform, (re)align, and (re)energize your collaborative efforts.